This school year I will be writing a series for Heart of the Matter based on our board Ends Policies. Ends Policies are written by the board as the guiding light for our school. They point the way toward who we want to be and where we want to go. Ends Policies may seem lofty because they are meant to be grand goals that we may never fully reach but we are always working toward. The Executive Director is responsible for implementing systems and programming at Rainbow Community School that work toward our Ends. For this series of Heart of the Matter, I will be sharing my interpretation of each Board Ends Policy so we all know what our intentions are as a community. The first and most important Ends Policy is our mission. What follows is an interpretation of our mission that is broken down, phrase by phrase. I hope that this feels as alive in you as it feels alive in me. This first verb in our mission is very important. As we often state, an education at RCS is more about development than mere achievement. Learning is the core of education. 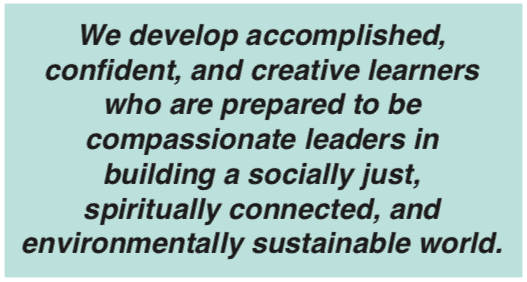 However, if learning is only instrumental, technical, or social conditioning, it is not sufficient to create humans who will become their highest selves — humans who will help society to evolve to reach its highest potential. Human development is a complex matter that, according to science, comes in stages. Children will remain at one stage for many years, but while they are in that stage, we are preparing them to successfully and beautifully transition into the next stage of development when they are developmentally ready. Additionally, we are helping them lay a foundation for successful development throughout adulthood by teaching them how to think critically, have strong character with positive values, and be integrated “whole” human beings. Achievement comes naturally when humans have been educated to understand and utilize their whole selves. Note that the term “developmentally appropriate” is often heard at Rainbow. As pedagogical scientists, we understand the appropriate abilities of learners at various ages. We know, for example, that you can teach a child to mimic advanced academic behavior at an age that is premature for them to truly understand it deeply, therefore stunting their ability to be more advanced at older ages. Likewise, we know that when only one aspect of development is overemphasized at stages of development, it stunts holistic development in other domains. The most common example in our society is the advanced “false” development many schools try to force onto children before they are ready. 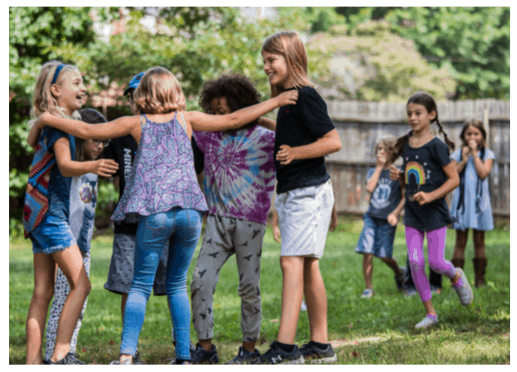 Because the children are not ready, forcing such advanced academic work on them requires cutting out other activities that would develop their whole selves such as play, creative activities, and unstructured social time. When one area of the brain is overemphasized, developmental “windows” of opportunity are missed in other areas. These missed developmental opportunities can never be fully recovered, and can result in a host of maladies, notably mental health issues. In general, this triad is meant to evoke the triad of beauty, truth, and goodness. Although accomplished, confident, and creative don’t match up one-to-one with beauty, truth, and goodness, the concept of health and wholeness coming in triads is important. Triads create balance that a duality can never achieve. Triads create a dialectic where two aspects of a triad may be working together or in tension with one another, and then the third element is a catalyst for change or evolution/development to a higher level. RCS is not just a learning lab where students will devour knowledge provided by a teacher; it is real life. We want students to have authentic experiences in the world including opportunities to see problems in the world, and to act out of goodness to alleviate them, either through service, service- learning, or creating inventions and design plans that have the potential to help. “Accomplished” also means that students need to be productive. They need to leave RCS having literal, material accomplishments such as awards and achievements; and they also (or more so) have to establish productive and positive work habits and manners of being, so they are set up for success for the rest of their lives. “Confident” has to do with the way learners approach the world. 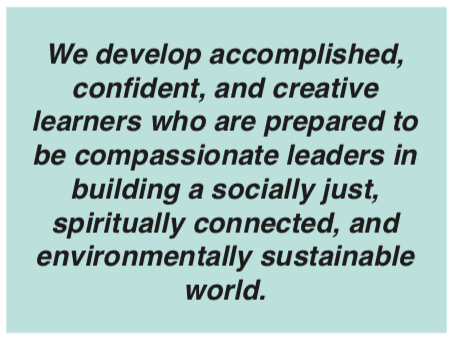 We want learners to see themselves confidently as forces of good in the world. To have this sense of confidence, they need to have worked to find their own personal truth, including understanding that truth is a flowing concept and they will forever be changing and adapting their truth as they confront new realities in life and in their being. This means they have to be robust critical thinkers who don’t merely consume information, but evaluate and apply it. This means they need to have developed an epistemological stance in life where they can understand complexity, think in systems, and later in life visualize and mentally manipulate systems within systems. The creative learner has developed their heart. In the triad of head, heart, and hands, they have learned that the heart – not the head – is truly the best “boss;” and when the triad is in balance, the head and the hands are in service to the heart. Creative learners have had the immense privilege of being allowed to “follow their heart” and have discovered those results experientially. Through taking such risks they have learned wisdom through mistakes, including the wisdom to know that mistakes are necessary, forgivable, and often lead to brilliance. Partly, through their own experience with mistakes, they have developed true compassion for the human-ness of others. every learner has different gifts and challenges. Therefore, prepared means making sure each student has developed essential learning skills that have prepared them to continue learning throughout life. to meet the world with one’s authentic self – so by the end of eighth grade students will have prepared themselves through deep personal analysis and inner reflection. In part, “compassionate” is in contrast to “competitive.” Although there is solid scientific evidence that some humans have the competition gene and need healthy opportunities to compete for proper development, the idea of having competition as the bedrock of society is, according to anthropological evidence, completely misguided. Humans would not have survived thus far if they were not naturally collaborative – working together and pooling the greater mind of the group to overcome nature. Unfortunately, we became so good at overcoming nature that we have completely dominated it to the point that our very survival now depends on us collaborating in ways that span vast and complex systems. Now, instead of overcoming nature, we need to overcome greed, misguided individuality, and paradigms of injustice. In short, we need to overcome our compulsion and deep-seated cultural habits to exploit the earth and one another. Learners who are compassionate have learned from a very early age to sit still and go inward to reflect on their emotions and notice how emotions affect their thoughts and actions (and more emotions). They have learned how to articulate these emotions, and therefore, recognize emotions in others. They have learned empathy – the ability to relate to the feelings of others and to be connected human beings. This helps learners communicate in a manner that breaks barriers and frees the mind and heart to learn and to learn even more by collaborating and working with others. Compassionate learners don’t just feel, they act out of this compassion. They are considerate of others in their decisions. After all, that is what leaders do – they consider others. The word “leaders” – like all words in our mission – was considered carefully. In this case, the concern was whether or not the term implies forced leadership, or the expectation that every student be a dominant person, when the world has enough dominate people. In the end, it was decided that anyone who is a good role model is a leader, and good role models are what we expect a Rainbow graduate to be. Whether we are still designing, excavating, or have moved onto laying the foundation or even construction, the point is that Rainbow graduates will be helping the world make positive progress toward becoming a socially just, spiritually connected, and environmentally sustainable world. They will not take, they will give. They will not rest (except to the degree resting is healthy), they will work. They will not give up because it’s hard, or it’s painfully slow, or because sometimes it seems like we are moving backwards. They will not give up because they cannot do it all by themselves. They will wake each morning with a purpose in life. This phrase is expounded upon in the interpretation of Ends-4. Here it is enough to say that the world a Rainbow graduate is working toward is one where every human has the opportunity to have not only their basic needs met, but also to become a self-actualized person, to use Maslow’s language. Every person, no matter what their circumstances or how rare (or common) their perceived differences may be, deserves to be included and cared for by a loving, communal, societal force. The interpretation for Ends-5 provides an exploration of Rainbow’s spiritual end. We envision a world where human spirituality is recognized as a core aspect of being human, if not the very thing that makes us human – that breathes life into our souls. In such a world, spiritual development would be understood as an important aspect of education, work life, and family life. It would not be relegated to those who choose to be a part of an organized religion, but instead it would flow through the veins of our civil life. Rainbow graduates will help create a world where we recognize, honor, enrich, and utilize our spirituality to create greater well-being for all people. To accomplish this means shifting out of the paradigm that became firmly established during the industrial revolution of linear thinking to one that thinks and operates in systems, cycles, and webbed networks. This also means shifting out of the current American paradigm where the economic sphere is the most important, or dominating, social sphere — where virtually everything is “commoditized” and economic growth (typically for the few) and competition is the underlying mandate from whence most political and social (and individual) decisions and actions are made. The new, sustainable paradigm would move us out of our current anthropocentric attitude (where humans are viewed as the center of the world), and put humans in relation to all of nature and as stewards of the natural world. Harmony. In general, as practitioners of holistic education, we know that the whole is always much greater than the parts added together. For the sake of analysis and greater understanding I have broken our mission statement into parts and pieces, but our mission comes to life when it is whole. Our mission comes to life every day when we live it — every morning when our teachers arise in thought and meditation for their students; every moment a child expresses wonderment and is embraced in love; every year when we, as a community, come together with awe and appreciation for our human qualities – including (and perhaps especially) our faults; in order to lift one another up so that our children can be better than us.